← Buster Keaton, Seven Chances, and Warren Beatty? Marc Wanamaker of Bison Archives, and Bruce Torrence of HollywoodPhotographs.com, both accomplished authors, photo archivists, and historians, are two behind the scenes giants of Hollywood history. Wanamaker, a foremost authority on all things Hollywood, especially its movie studios, has supplied material for hundreds of books, and has appeared onscreen in numerous documentaries. Marc has written more than a dozen books on topics including Paramount Studios, the Culver City Studios, Beverly Hills, Warner Bros., and Hollywood itself (see more Amazon links HERE). Torrence has Hollywood in his DNA. His grandfather, noted developer C.E. Toberman, built dozens of Hollywood subdivisions and commercial buildings, including the Egyptian and Chinese Theaters, while his other grandfather, towering actor Ernest Torrence, was an early screen star, playing roles such as Captain Hook in Peter Pan (1924) and Buster Keaton’s father in Steamboat Bill, Jr. (1928). Bruce’s 1979 groundbreaking account “Hollywood: the First 100 Years” was an instant classic, and his recent “The Hollywood Canteen” documents Hollywood’s morale boosting efforts during WWII. Bruce also writes The Hollywood Photographs blog, with dozens of articles about Hollywood landmarks and history. Aside from their informative books, Marc and Bruce both manage incredible photo archives that allow us priceless views of Hollywood’s past, and have generously assisted countless other authors and historians. I am personally indebted to Marc and Bruce who have been remarkably kind and supportive to me over the years. This post revisits a few fun location discoveries that would have been impossible to solve without access to their extraordinary photos. The newly discovered stunt scene from Keaton’s My Wife’s Relations was filmed on this set at Buster’s studio. Buster later used the set for a scene with some police in Day Dreams (inset). Read the full post HERE. HollywoodPhotographs.com. 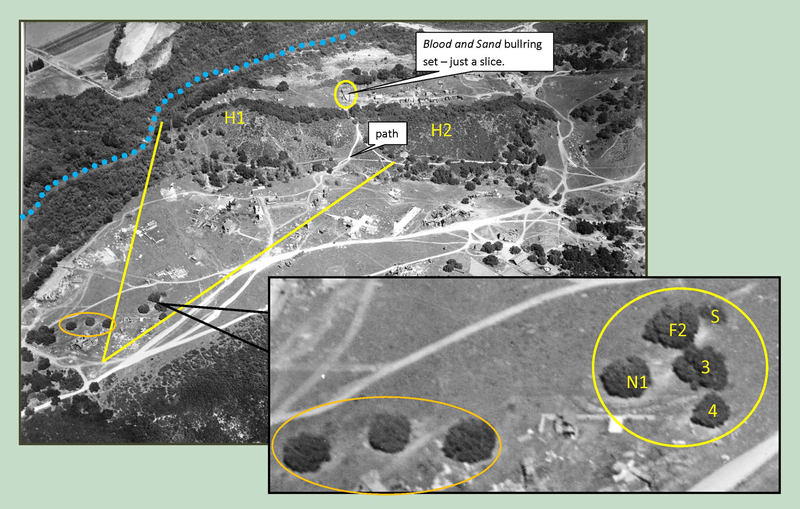 Using several of Marc’s photos I was able to prove that a few trees appearing in the battle scenes from The Birth of a Nation (1915) are still standing at Forest Lawn. They appeared with the Three Stooges too. Read the full post HERE. Marc Wanamaker – Bison Archives. Click to enlarge. 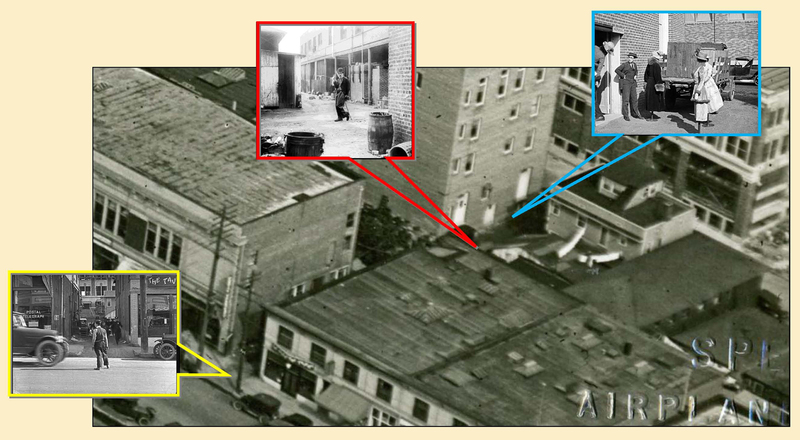 In this post I examine the major Hollywood landmarks appearing in a single 1926 photo. From left to right: the Pickford-Fairbanks Studio (red oval), the Chaplin Studio (yellow oval), the Bernheimer Estate and future Magic Castle (teal oval), the Hollywood Hotel (red box), the Harold Lloyd (Hollywood Metropolitan) Studios (yellow box), the Keaton Studio (teal box), the block of Cahuenga south of Hollywood Boulevard where Keaton and Lloyd frequently filmed (orange box), and the intersection of Hollywood and Vine (purple oval). HollywoodPhotographs.com. 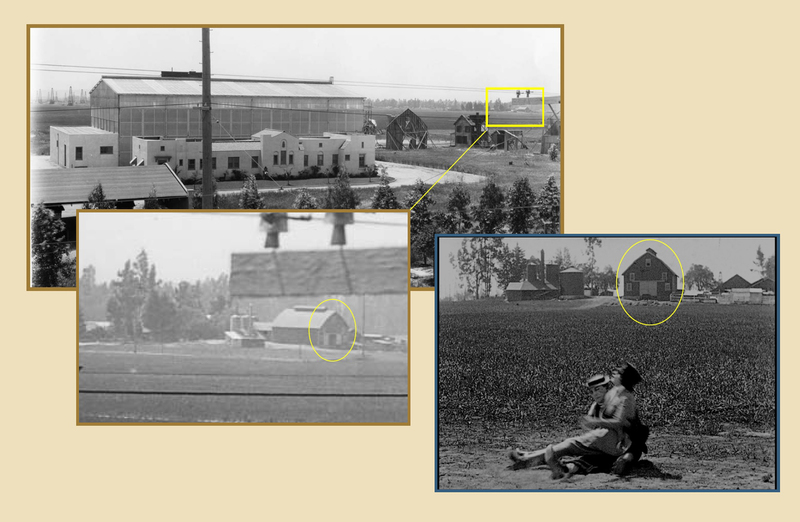 This ‘rural’ barn scene closing the new version of Buster Keaton’s The Blacksmith stood near Melrose and La Brea, in this view looking SW from Harold Lloyd’s Hollywood Studio on Santa Monica Boulevard. You can read several posts about the ‘new’ The Blacksmith HERE. Marc Wanamaker – Bison Archives. My favorite discovery, made possible only by examining many photos each from both Marc’s and Bruce’s archives, is that Charlie Chaplin filmed The Kid, Buster Keaton filmed Cops, and Harold Lloyd filmed Safety Last! at the same small Hollywood alley you can still visit today. Click to enlarge – looking NE at the alley running from Cahuenga (left) to Cosmo (right). You can read the full post HERE and HERE. HollywoodPhotographs.com. I would like to thank Marc and Bruce for all they have done to preserve, document, and share Hollywood’s rich history. Thank you Ron – their archives are both treasures. I am so thankful for the work that all of you do to keep Hollywood’s past in the present! You three are greatly appreciated! Thank you Rex – if the generous archivists didn’t share their movies and photos with the public there would be nothing available to study. I’m so grateful to Marc and Bruce for what they do. Love the aerial shot of Hollywood. I didn’t know that the Pickford-Fairbanks Studio was just a block south of the Evans estate. Very interesting. 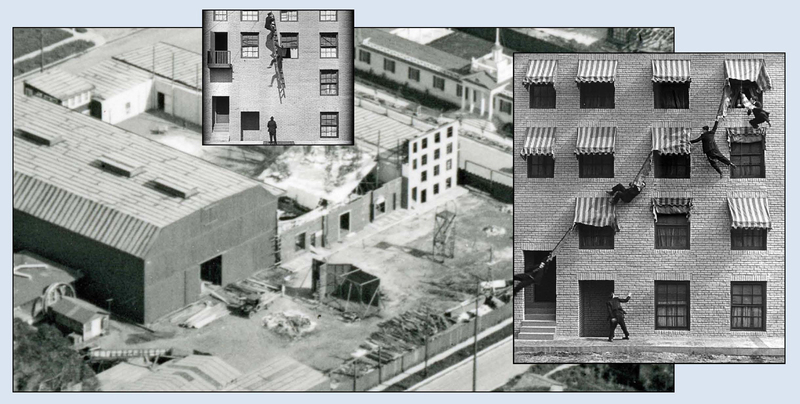 Thanks Tom – did you read the full post deconstructing all of the landmarks in that photo? In 1926 Doug, Mary, Charlie, Harold, and Buster were all at the top of their game, busy working within a few blocks of each other. That photo tied everything together. I did read that post. It is an amazing photo. However, if it only just went a little more east, a bit past Gower, I’d like it even more! A wonderful piece recognizing these two men. While I have not (that I recall) had the good fortune yet to have been in contact with Bruce, I have been the wonderful beneficiary of Marc’s generous assistance over the years, especially with my research into the location of the Hal Roach Studios Ranch. I’ve had interactions with both over the years and I have been so impressed with the breadth of their knowledge, their genuine love of old Hollywood and, most importantly, getting the story right. 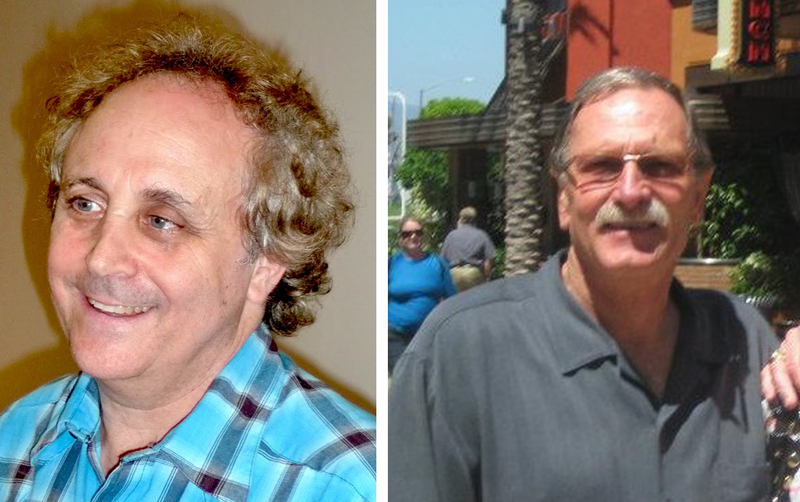 Anyone who loves Hollywood history owes Marc Wanamaker and Bruce Torrence a huge debt of gratitude. Thank you for highlighting these irreplaceable resources/treasures!